Fox & Weeks Funeral Directors was honored to present a $1000 Matthew’s Children’s Foundation grant to The Fresh Air Home on Tybee Island in June. Fox & Weeks has now awarded more than $25,000 in Matthew’s Children’s Foundation grants since 2012. Each time a family purchases a casket at Fox & Weeks, a portion of the cost is donated to the Matthew’s Children’s Foundation in the name of the deceased and the accumulated funds are distributed quarterly through an application process to area non-profits benefitting children and children’s causes. The Fresh Air Home is a Savannah tradition dating back to 1897 and remains dedicated to improving the lives of underprivileged youth. Every summer, The Fresh Air Home opens its doors to hundreds of Savannah area children with the mission of improving the health of the children, building character and helping them grow into better men and women. 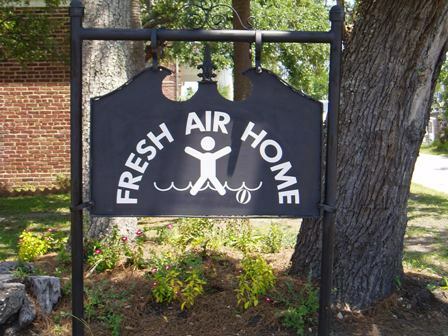 The Fresh Air Home is a non-profit organization operated and maintained by the Froebel Circle, a group of 50 dedicated women who are committed to serving God’s children. The Fresh Air Home is opened for eight weeks during the summer months, and each child is able to spend 11 days enjoying the ocean, salt air, playing on the beach and supervision by counselors of strong character. To qualify for a Matthew’s Children’s Foundation grant through Fox & Weeks, an application must be submitted and an organization’s activities must be primarily directed towards the welfare and benefit of children. Fox & Weeks is the only funeral home in the area actively participating in the Matthew’s Children’s Foundation program. Please click Matthew’s Children’s Foundation Grant Application to learn more or to submit an application for review.